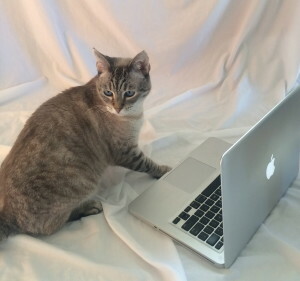 I’ve been studying the cat videos on the interwebs. This is something we should be doing. Making our own cat videos. Starring you I would imagine. Of course starring me! I’d be perfect. We’d get bajillians of hits. People think I’m cute and pretty. Not when you’re having one of your psychotic episodes. That would be way too scary. I won’t have one of those in the video. If you did you’d probably get a whole different following. You could call yourself Slasher. Sorry, I can’t resist. It’s amazing to me that you are such a sweet cat, yet you can instantly transform into such a scary one! Slasher is a perfect name for your alternate personality. I saw it last night and I’ve got the bloody cut on my hand to prove it. I warned you not to keep petting me. You didn’t pay attention. You gave me a micro-second to respond! I don’t want to talk about that. I want to talk about my video career. I’m not going to make Slasher videos. I’d rather do something cute. I’m working on the script right now. A script! Okay, I have to say I’m impressed. That’s very sophisticated. Are you going to wear cute costumes? Little hats? No, those are for losers. I don’t need them. But we do need to get a Roomba. So you can be one of those dignified cats riding around on a Roomba? It so would be worth getting a Roomba just to see you on it, even though it would probably kill Puffin and Poppy. They’d die of fright. They’ll get over it. And I’ll be famous.